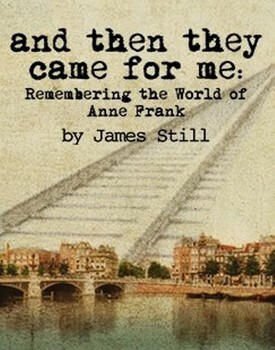 IRT Upperstage’s new offering, and then they came for me: Remembering the World of Anne Frank by IRT’s Playwright-in-Residence James Still, is an extraordinarily stirring production with regard to writing, performance and visual presentation. Under the insightful direction of Courtney Sale, the play combines live action with a multi-media display for an emotion confronting experience. Centering on the harsh experiences of European Jews in and around Nazi Germany, the play features the parallel true life stories of Eva Geiringer and Ed Silverberg, who were both teenagers at that time and who both had connections to Anne Frank. Ed was a young friend of the famous diarist, and Eva, also an acquaintance of Anne, became the step-daughter of Anne’s father Otto, after he married Eva’s mother following the war. By telling Eva and Ed’s stories of having their young lives turned upside down by the Nazi occupation, their flights, their hiding away, their separations and their losses, playwright Still creates for us a remembrance that is alternately wrenching and poignant. His prominent use of actual interview footage of the two survivors solidifies our personal reactions of shock, shame and loathing. The cast’s work is highly skilled and features devastatingly effective performances by IRT veterans Jennifer Johansen and Mark Goetzinger as the varied parents in the story. We are also privileged to watch a youthful and talented quartet – Elizabeth Hutson, Weston LeCrone, Joseph Mervis and Zoe Turner, who carry out their assigned roles with polish and a perfect understanding of their plights. Mervis and Ms. Hutson absolutely shine as the young Ed and Eva. Their emotive portrayals of their characters’ travails in such painful times are vivid, steady and true. Cast mates LeCrone and Ms. Turner added additional strength to the story with their solid depictions, especially Ms Turner, whose Anne Frank is such a lively and vital beauty, we were left feeling that Frank’s effect on our lives was truly meant to be so much more, if only she had not been taken away. Mention must also be made of the wonderfully versatile and perceptional setting for the play which was created by Scenic Designer Rowan Doyle and Lighting Designer Betsy Cooprider-Bernstein. Their uses of subdued colors, rails, barbed wire and dynamic lighting effects furthers our impressions of oppression and strife. Guy Clark’s simple and correct costume designs, and sound patterns designed and composed by Todd Mack Reischman completed the vision. I thoroughly enjoyed this emotional and thoughtful remembrance of Anne Franks world – it was a stirring reminder of something that can never be allowed to happen again. And it is important as a statement of how humans can be drawn away from civility through wrong-headed pride and fervor. I was especially pleased to learn, in the curtain announcements, that 12,000 students are expected to attend this show over the next few weeks. It will be especially enlightening to young people who can not imagine that such a shocking and devastating story could be true. Public performances of and then they came for me: Remembering the World of Anne Frank continue through February 15. Information about dates, times and ticket reservations can be found by going to http://www.irtlive.com or by calling the IRT ticket office at 317-635-5252. My first IRT performance and I couldn’t be happier. A telling of the Anne Frank story that is fresh and new, yet still as compelling and poignant as one would expect. Excellent performances all around – veterans or new-comers. A rare privilege to watch future stars grow before your eyes, particularly Zoe Turner, Joseph Mervis, and Elizabeth Hutson. But it really isn’t fair to name names as all cast members carried out their roles to absolute perfection. Whether direction, script, or set, this amazing production was extremely and expertly well-done from any angle. I shall, without doubt, be back for a repeat performance. Bravo!